">"> A Tale of Ice! The following tale is reproduced from an email sent round to a 'selected' few with the permission of my mate and all round good chap Phil Wimbush who's an SDM (Line Controller) on the Central Line. It tells his story of getting into work on Wednesday 28th January 2004. The tale is told in Phil's own inimitable style, with a few explanations shown in italics added by me by way of explanation of some of the jargon! The photos added are also kindly supplied by Phil, who just happened to have his camera with him. Actually I don't think he ever travels without it! Yes the rumours of my demise are totally unfounded. Wednesday Mornings Journey to Work - West Ruislip to North Acton in 6 hours!! I was planning to take the 0532 departure from West Ruislip - just made it into car 7 as doors were closing, set off well enough but going past Ruislip Depot started slowing down!! Stopped about half way past the depot, not many of the train's lights on. I called the Central Line control office on my mobile to see if the driver had called in yet; he hadn't so made my way forward to front cab. Delighted to see one of the more decent West Ruislip Drivers sat there trying for forward movement. The front unit was dead, movement was being obtained in fits and starts; managed to get into Ruislip Gardens about 0600 after some ice scraping was undertaken; also tried driving from the back cab in reverse, and shunting cabinets through the train, that's how we managed to limp to Ruislip Gardens. The train was detrained and we set off again; same story. By around 0645 by a combination of methods we arrived 2 cars into South Ruislip where the back unit packed up too. We did suggest a 'pushout' (assistance from another train) at several points and at 0645 it was agreed. We duly coupled up to the assisting train and moved off. Got up to some lively speeds - all of 16KPH (a record for the front train! ) - and heading towards Northolt the Semi (Semi Automatic signal) was red, so we stopped about a trains length short, and there we stayed for 90mins. The first westbound train had been reversed at Northolt and was heading back into town when it stalled half way between Northolt and Greenford, around the canal bridge for anyone that knows it. The original plan was to use our 16 cars to push those 8 forward to Greenford, but we could not get moving again after we stopped for the signal, so juice off and walk 70ish cold wet and miserable folks down the track back to Northolt (which was slightly nearer and in sight). During the 90mins the Train Operator from the 'pushout' trains - assisted by my good self - ice scrapped all the way to Northolt Station both roads. The second westbound train had come through Northolt and Stopped 6 cars out, Stalled - no current, so the plan was for us to get him going as well, which we did once Traction Current was recharged. By the time we arrived at Northolt with Ice Scraping Kit the ERU (Emergency Response Unit) was around slopping de-icer fluid onto the juice rails with a mop. Once Traction Current was recharged we uncoupled and the lead unit headed into Northolt, Sleet Brushes down (as they had been all the way) and spraying fluid (which 92's only do above a certain speed). The train down at the canal bridge would not restart and Ruislip DDM (Depot Duty Manager) turned out with a battery pack to boost it (like you see on Casualty I'm told). The train was then brought back 'bang road' (against the normal direction of travel) to Northolt Crossover and over to Ruislip Depot for some TLC. We then departed as the first train of the day albeit empty (about 11.00) to get past the Canal Bridge, again, sleet brushes down and de-icer on, local Pway (Permanent Way) gang on board, the law of sod of course applied here because the sun had been out for a few hours and the rails were not only ice-free but bone dry !! Of course the section east of Hanger Lane, being in a cutting, the sun had not got to it so was untouched and we whistled through Hanger Lane doing line speed and as we ploughed into the ice sheet the speed dropped a little bit and lots of arcing and farting we made it to North Acton at 1130. I then left the train and made my way into the office, where I arrived at around 12 o'clock. Only then to announce of course that I'm going on my meal break which I did!" The First & Indeed second eastbound trains, stopped approaching Northolt stalled. 07.10 - Northolt - Stalled train. 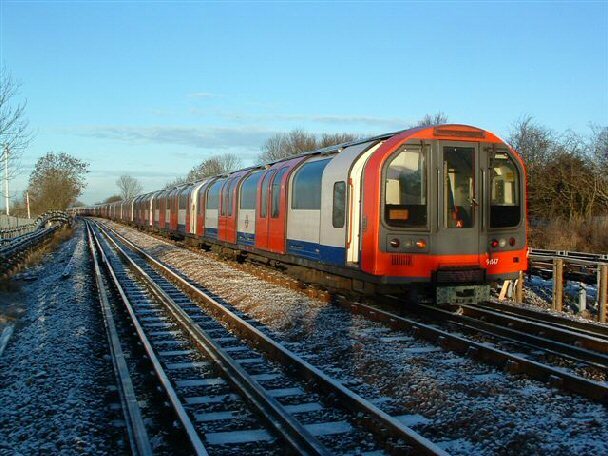 Central Line services suspended between North Acton and West Ruislip from this time due to Eastbound train 112 stalling in section approaching Northolt station some 3 train lengths from the platform. 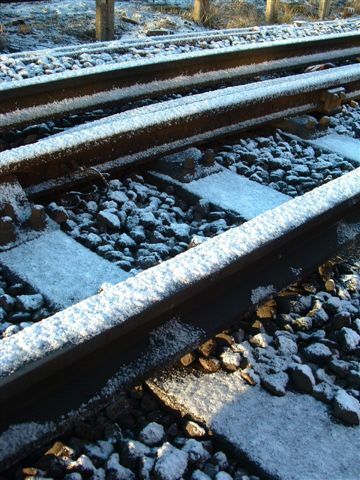 The train had already experienced severe difficulty obtaining traction having departed West Ruislip. Staff dispatched to site to assist in scraping rails to obtain some movement, unfortunate ERU services not readily available with all teams deployed elsewhere. NA100 procedures implemented at 07.45hrs and at 08.12hrs decision taken to detrain the 69 customers on the train and walk them forward to the platform. ERU day team from Vauxhall dispatched to site at 08.13hrs. Two ambulances requested to standby and two emergency replacement buses organised to convey customers. By 09.35hrs all customers fully detrained including 1 male with a broken ankle ( previous injury) no assistance of ambulance staff required. Buses utilised to convey customers all stations to North Acton or across to South Harrow to continue their journeys. ERU along with Central line track team continued to work scraping rails and by 11.00hrs stalled train on the move slowly to North Acton. Two trains were then used to sweep between West Ruislip and North Acton, this convinced control room staff that services would no longer stall and through services subsequently restored to West Ruislip at 12.00hrs and NA100 withdrawn shortly afterwards.